Orders, decorations and medals of the Soviet Union There are 40 products. 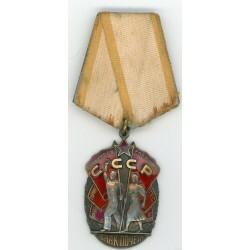 Russian Soviet Medal "50 Years of Victory in the Great Patriotic War of 1941-1945"
Silver gilt, enamels; measures approx.50mm in height incl. eyelet,approx. 33 mm in width. Serial number is 1107232.Date 1955-1988. 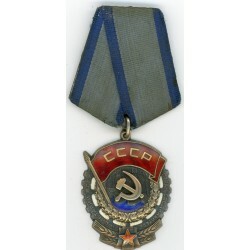 The medallion is single piece construction, with letters "CCCP" struck as part of the badge. Silver gilt, enamels; measures approx.50mm in height incl. eyelet,approx. 33 mm in width. Serial number is 1016281.Date 1955-1988. 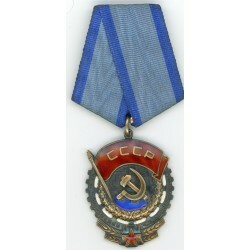 The medallion is single piece construction, with letters "CCCP" struck as part of the badge. Silver gilt, enamels; measures approx.50mm in height incl. eyelet,approx. 33 mm in width. Serial number is 313870.Date 1955-1988. 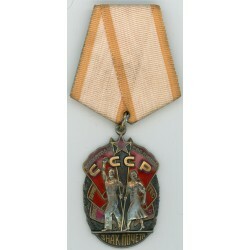 The medallion is single piece construction, with letters "CCCP" struck as part of the badge. 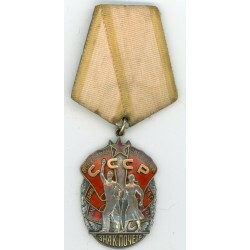 The Order of the Red Banner of Labor, Type 6, Variation 2, 1104735 Silver gilt, enamels; 47.3 mm tall (incl. the eyelet), 36.8 mm wide. Riveted 3-piece construction. The serial number is engraved with a rotating tool. 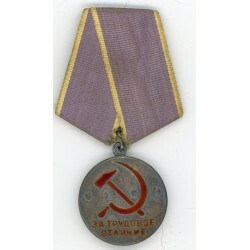 The Order of the Red Banner of Labor,977585, Type 6, Variation 2 The medallion is in silver gilt and enamels; 47.8 mm in height (incl. eyelet), 37.1 mm wide. Features rotating tool engraved serial number. This specimen was manufactured in 1974 at the Leningrad Mint. 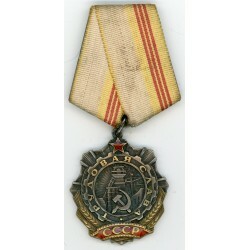 The Order of the Red Banner of Labor,792175, Type 6, Variation 2 The medallion is in silver gilt and enamels; 47.8 mm in height (incl. eyelet), 37.1 mm wide. Features rotating tool engraved serial number. This specimen was manufactured in 1974 at the Leningrad Mint. 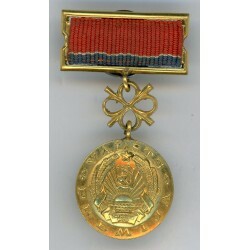 Order of Glory, 3rd class,678543, circa 1970s. Silver, enamels; 46.0 mm wide. Late variation, with rotating tool engraved serial number. 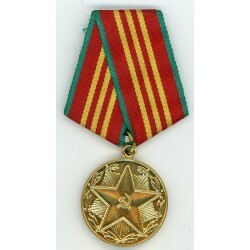 Order of Labor Glory, 3rd class, Type 2 without number. Silver gilt, enamels; 40.9 mm wide. Type 2 featuring single- piece medallion without rivets. In good condition. The enamel is pristine. 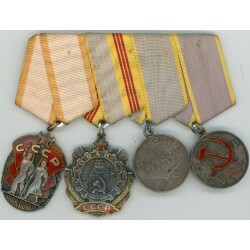 RUSSIAN SOVIET RUSSIA USSR Medal Set of 4 Medals Set of 4 Medals is in excellent condition. The serial number is engraved. 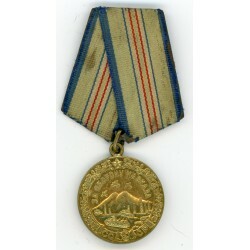 Medal for the Defense of Caucasus,was established on May 1,1944. In brass; 32.2 mm wide. In good condition. The details are crisp, practically pristine. 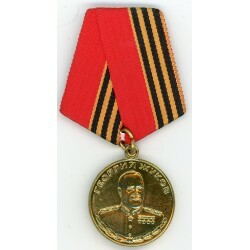 Marshal Zhukov Centenary Medal, 1996. 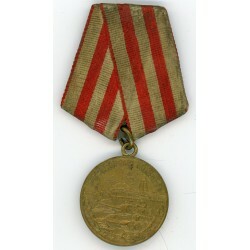 32mm in diameter brass medal. Good condition. 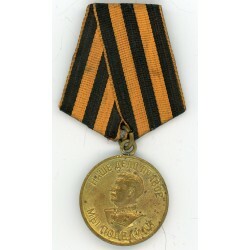 Medal for 20th Anniversary of Victory over Germany. Good condition - 32mm in diameter circular brass medal. 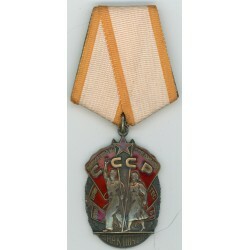 Jubilee medal. 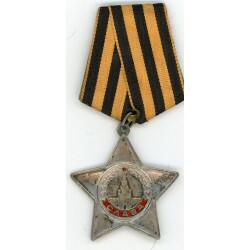 RUSSIAN MEDAL FOR THE 20th ANNIVERSARY OF THE VICTORY OVER GERMANY IN WORLD WAR 1945-1965 WITH RIBBON. 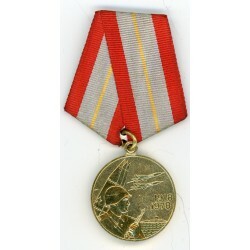 The Jubilee Medal "50 Years of the Armed Forces of the USSR" was a 37mm in diameter circular gilded brass medal. Good condition. 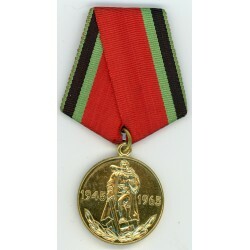 Medal for 50th Anniversary of Victory over Germany is a 32mm in diameter tombac circular medal. Good conditions. 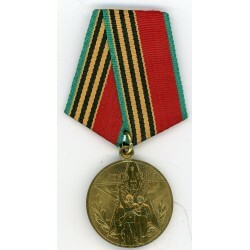 This medal was awarded to all surviving war veterans, including many of those who now live in the former Soviet republics outside of Russia. 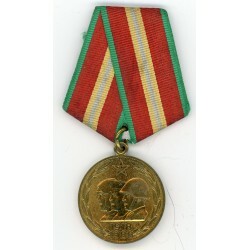 The Jubilee Medal "Thirty Years of Victory in the Great Patriotic War 1941–1945" was a 36mm in diameter circular brass medal. Good condition. 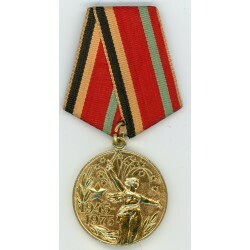 The Jubilee Medal Forty Years of Victory in the Great Patriotic War 1941–1945 was a 32 mm in diameter circular brass medal. Good condition. 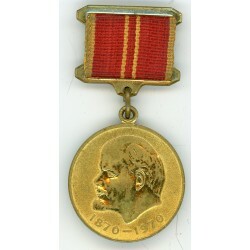 The Jubilee Medal "In Commemoration of the 100th Anniversary of the Birth of Vladimir Ilyich Lenin" For Valiant Labour was a 32mm in diameter circular brass medal. 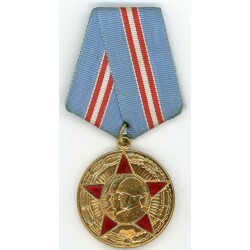 All three variants, civilian, military and for award to foreigners shared the basic design. Good condition. 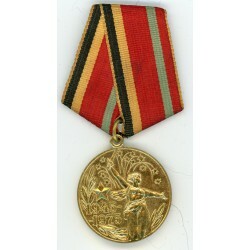 Medal for 60th Anniversary of the Soviet Armed Forces,was a 32mm in diameter brass circular medal with a raised rim on both sides. Good condition. 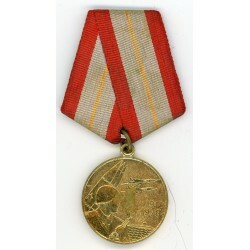 Medal for 70th Anniversary of the Soviet Armed Forces,was a 32mm in diameter brass circular medal with a raised rim on both sides. Good condition. 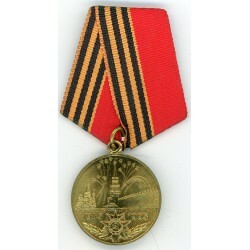 Medal for the Defense of Moscow, is a 32mm in diameter circular brass medal Good condition. 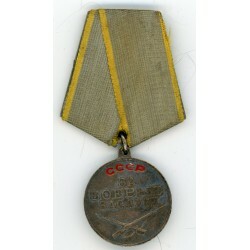 A Soviet Russian Medal for Combat Service; Type II;Variation 3 Silver with red enamels, number stamped "2564339" on the reverse, 32.2 mm, original ribbon, mounted to a five-sided aluminum suspension with pinback, intact enamels, near extremely fine. 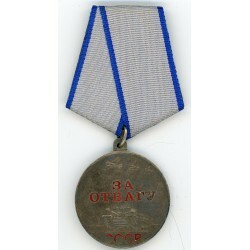 The Medal for Courage or Medal for Valour (Russian: Медаль «За отвагу») , Type 2 Variation 1, #3461377 Silver, lacquer; 37.4 mm wide; in good condition. 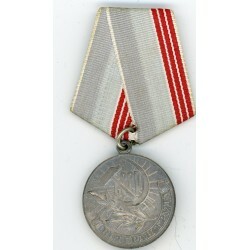 The Medal "For Labour Valour"
The Medal "For Labour Valour", Type 2 #42039 The Medal "For Labour Valour" was a 34 mm in diameter;Silver, enamels. Good conditions. 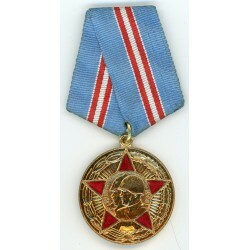 Medal for Distinguished Labor, Type 2 Var 1, numbered, #60976 was a 32 mm in diameter circular medal struck from 925 silver and enamels. Good conditions. 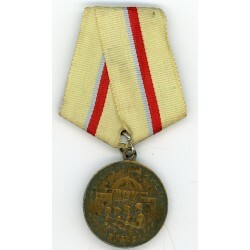 Labor Veteran Medal, variation with mint marked eyelet, 1970s- 80s. It was a 34 mm in diameter circular medal struck from tombac and then silver-plated and oxidised. Good condition. 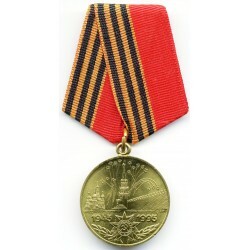 Medal for the Defense of Kiev, is a 32mm in diameter circular brass medal with a raised rim. Good condition. 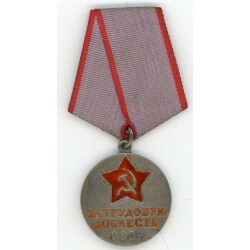 The Medal "For the Victory Over Germany in the Great Patriotic War 1941–1945 was a 32mm in diameter circular brass medal with a raised rim on both sides. Good condition. 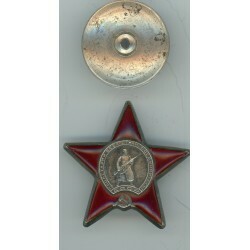 WW2 Russian Soviet badge medal of Order of the Red Star. This award is very rare and is sterling silver red enamelled 47mm to 50mm wide It has a serial number #3714174 Good condition. 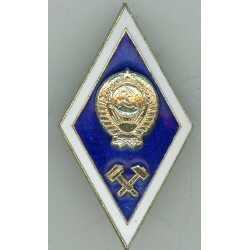 Badge of the Engineering Institute graduate in a good condition. Circa 70ies - 80ies of 20th centure.Consistent with its age, Please see scans! Gilded aluminum, enamels, mint marked. Riveted 3-piece construction, fine quality enamels; original "Leningrad Monetnyi Dvor" marked screw plate. . Dimensions – apprx. 47 mm x 26 mm. 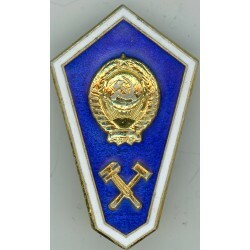 Rhomb shaped badge. 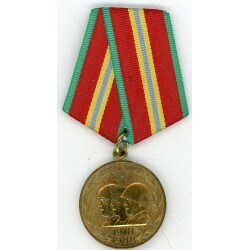 The Latvian medal "State Award" in a good condition.70ies of 20th centure(USSR) Tittle- State Award.Reverse-marker mark 1970,No.14 The badge ; multi piece constructional. Measures approx. 49 x 28 mm. Material -brass. The pictures are from actual item that you will recieve.